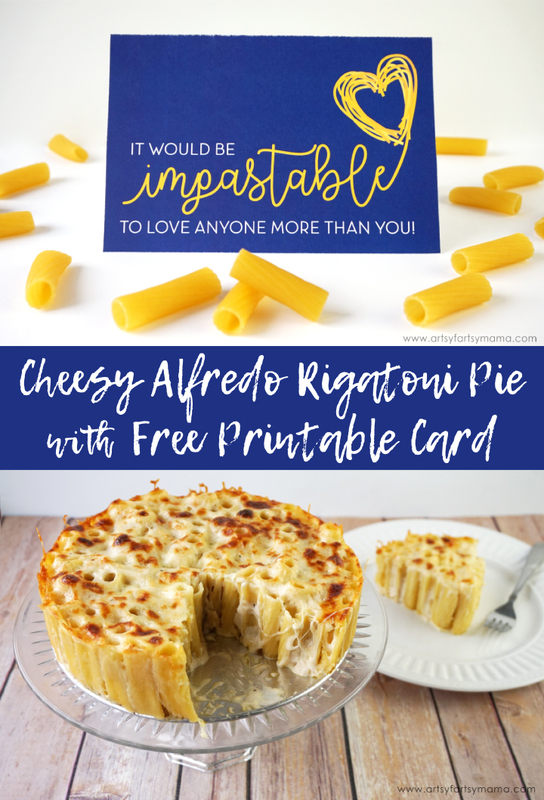 Make some Cheesy Alfredo Rigatoni Pie for a romantic night in this Valentine's Day and download a free printable card to share with your loved one! Date nights at home are the best! It's a great way to save money, and it helps us get a little more creative for spending time together. To make Valentine's a little lighter on the budget and to make things a little more personalized, I am planning a sweet Valentine's Night-In with my husband this year instead of getting a reservation at some fancy restaurant. I've also made a punny Valentine card (that really can be used for any occasion) to give my husband with a little gift! 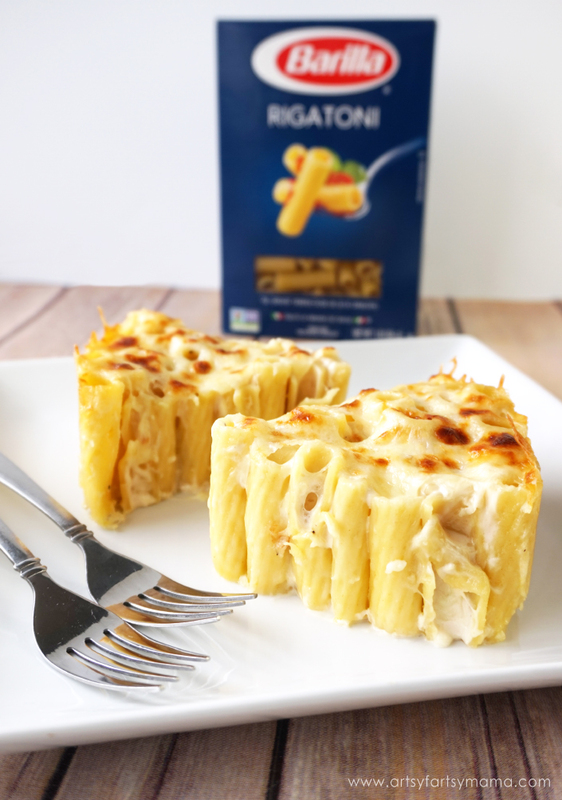 With a little help from Barilla® Rigatoni, I am going to make us a special pasta dish to enjoy. 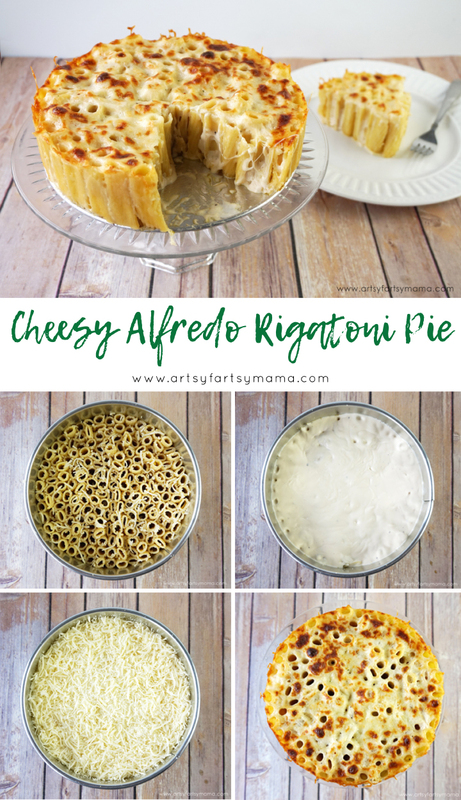 Cheesy Alfredo Rigatoni Pie is really easy to make, but looks like you spent all day in the kitchen (which is great for impressing your Valentine date, right?!). 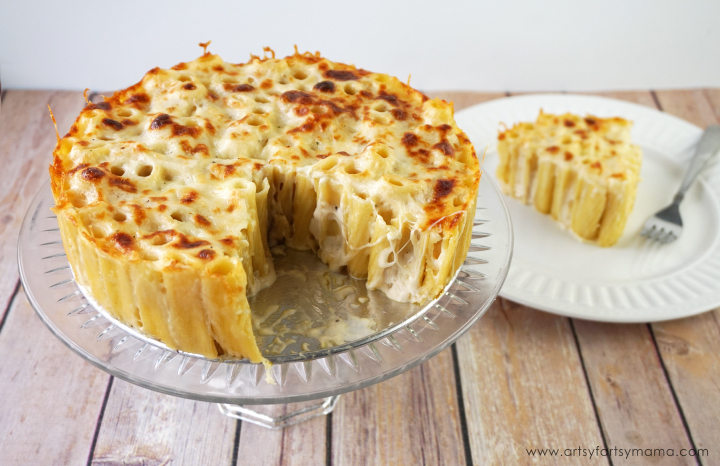 Using the Cartwheel Offer 5% off Barilla Pasta & Sauce at Target, I was able to save money on the ingredients I needed to make my Cheesy Alfredo Rigatoni Pie. 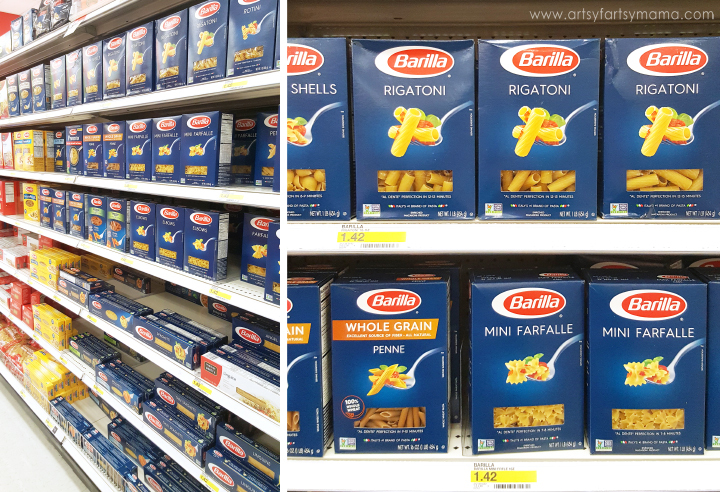 Both the Barilla Rigatoni pasta and the Barilla Creamy Alfredo Sauce are easy to find with the signature classic blue packaging in the pasta aisle! Bring 4-6 quarts of water to a boil, and add salt to taste. Add the Rigatoni pasta and cook one minute less than the packaging suggests for "al dente". For example, the Barilla Rigatoni pasta directions say to boil for 12 minutes to get al dente. I cooked the pasta for 11 minutes so that the pasta is slightly underdone. Drain the pasta and immediately rinse in cold water. Pour the pasta into a bowl and add in the Parmesan cheese and a little Mozzarella cheese. Carefully stir until all the pasta is coated. Spray a 8-9 inch springform pan with nonstick cooking spray. 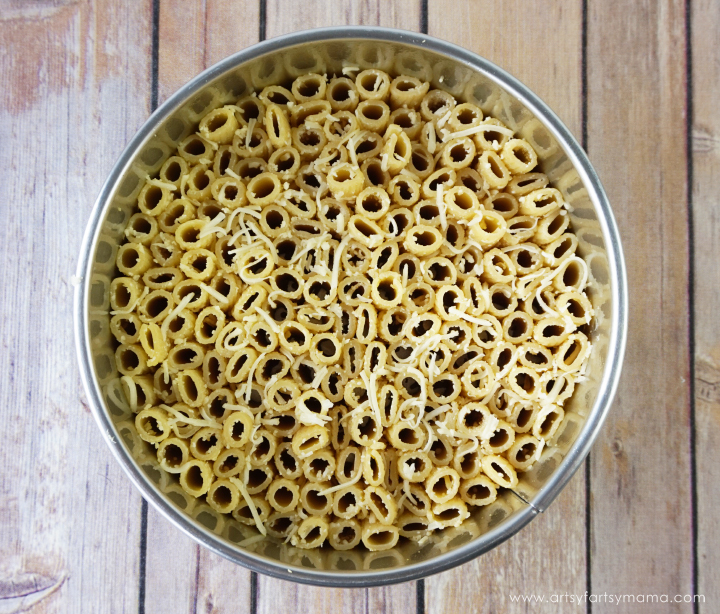 Tip the pan to a 45º angle and start laying the Rigatoni pasta so it's standing up in the pan. You will likely use the entire package of pasta. The trick is to pack the pasta in tightly. The cheese coating the noodles are going to help keep our pie together. Psst...Not all the pieces of pasta are the same height, so don't worry. You won't be able to tell once it's finished. Pour about 2 cups of Barilla Creamy Alfredo sauce* over all of the pasta. The sauce is delicious on its own, so you don't need to add any other ingredients. Lightly tap the pan on the counter to help the sauce fill in some of the pasta. You'll thank me for this step later. 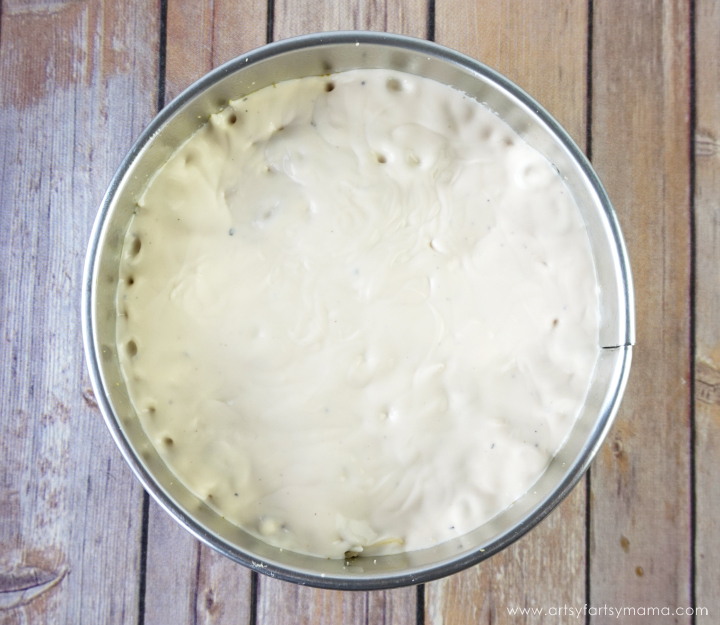 *You can also make your own Alfredo sauce if you have a recipe you love. I used the Barilla Creamy Alfredo sauce because it's delicious, and easy addition to this recipe, as well as a lot less dishes for me to wash.
Sprinkle the rest of the Mozzarella cheese evenly over the pie. You can also add a bit more Parmesan cheese if you want! Since not all springform pans are totally sealed, you will want to place a cookie sheet or another pan to catch anything that might drip out into your oven. 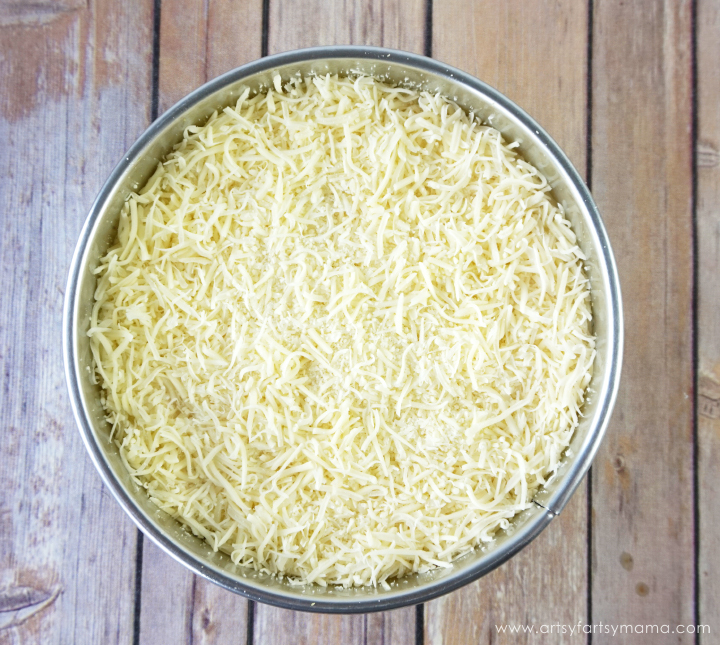 Bake the pie until the cheese is melted, and then broil for a minute or two to brown the cheese a little. Remove the Rigatoni Pie from oven at let cool for 5-10 minutes. Carefully run a knife around the edges, then remove the springform side collar. The noodles should all be holding together well and smelling delicious!! 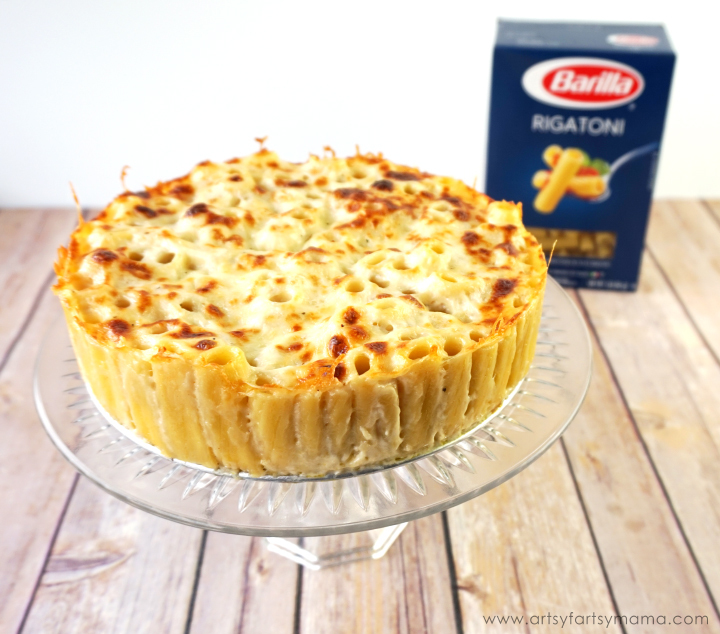 To serve, slice the Rigatoni Pie like you would any pie. As you can see, the Rigatoni gets filled with delicious Alfredo sauce. You can also cook some chicken to enjoy on the side, or cut chicken up into tiny pieces and add it in as a layer above the sauce! 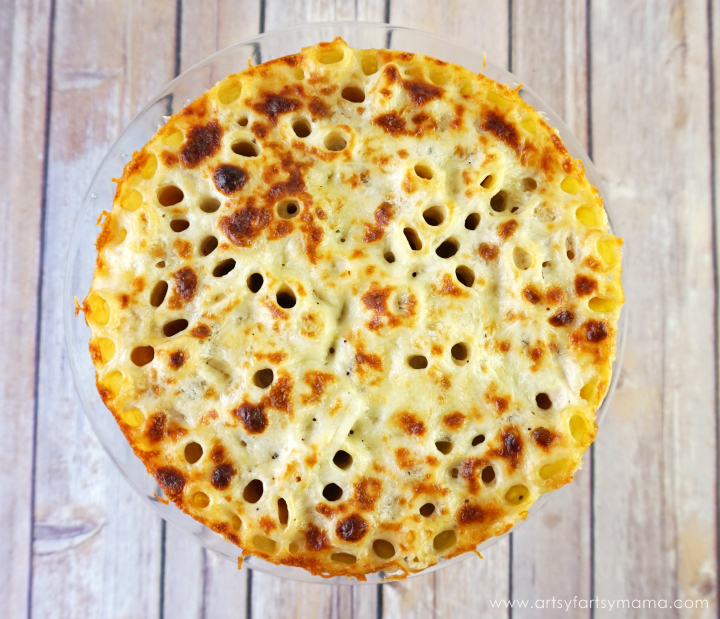 The Cheesy Alfredo Rigatoni Pie reheats fantastically (1-1 1/2 minutes in the microwave) so it's perfect for leftovers. A 9" springform pan should be plenty to feed a family. If you can find smaller pans (I couldn't), you can make personal sized pans for you and your spouse for a romantic night in. Bring 4-6 quarts of water to a boil, and add salt to taste. Add the pasta and cook for 11 minutes so that the pasta is slightly underdone. Drain the pasta and immediately rinse in cold water. Pour the pasta into a bowl. Add in the 1/2 cup Parmesan cheese and 1/2 cup Mozzarella cheese. Carefully stir until all the pasta is coated. Spray a 8-9 inch springform pan with nonstick cooking spray. 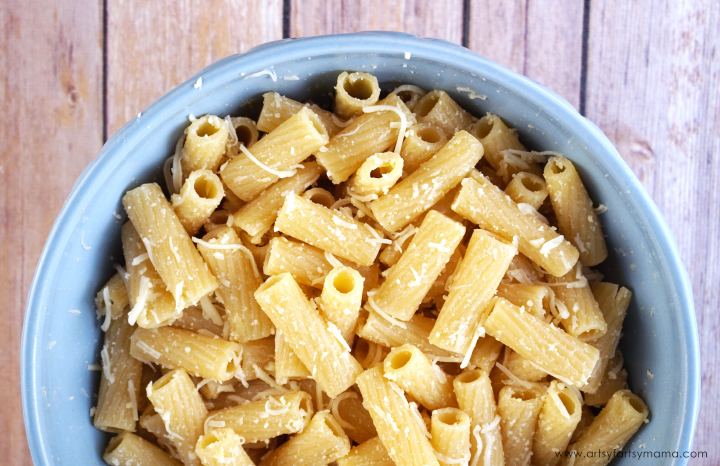 Tip the pan to a 45º angle and start placing the Rigatoni pasta into the pan so it's standing up. Pack the pasta in the pan tightly for best results. Pour about 2 cups of Barilla Creamy Alfredo sauce over the pasta. Lightly tap the pan on the counter to help the sauce fill in the pasta. Sprinkle the rest of the Mozzarella cheese evenly over the pie. Bake at 350º for 30 minutes or until all the cheese is melted. Broil for a minute or two if you'd like to brown the cheese a little. Remove from oven at let cool for 5-10 minutes. Carefully run a knife around the edges, then remove the springform side collar. 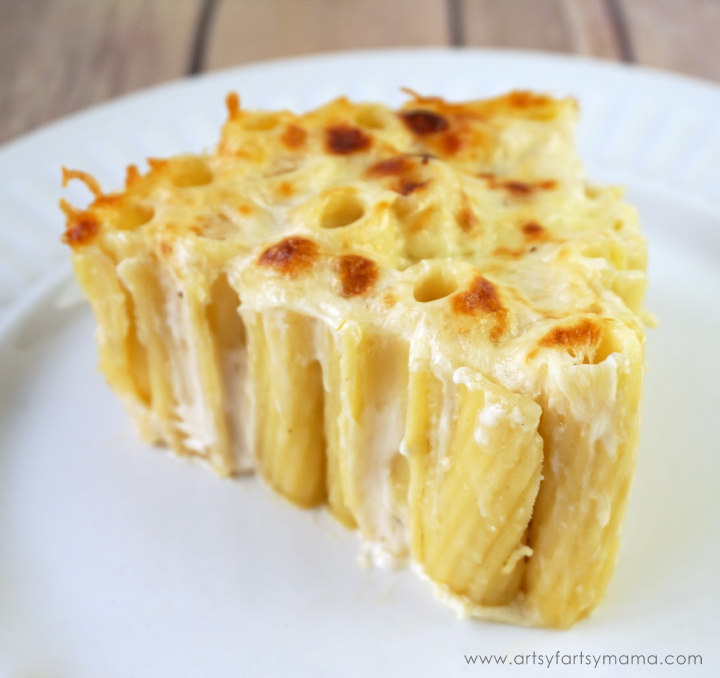 To serve, slice the Cheesy Alfredo Rigatoni Pie like you would any pie. *This dish works best using Rigatoni pasta, but any of the fun Barilla pasta shapes would work if you use a casserole dish instead. Since our Valentine's Day dinner is homemade, I also created a punny card to give my husband on the big day! I think it's hilarious, even though he might find it "cheesy"!!! 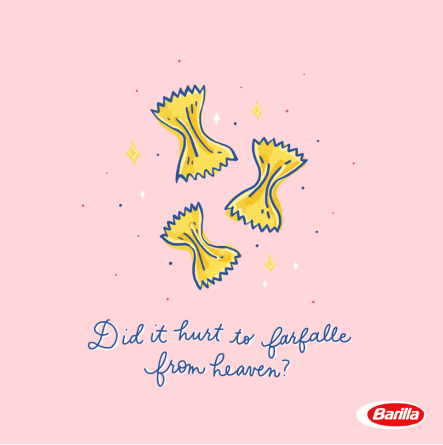 Obviously, Barilla shares the same love of puns that I do. 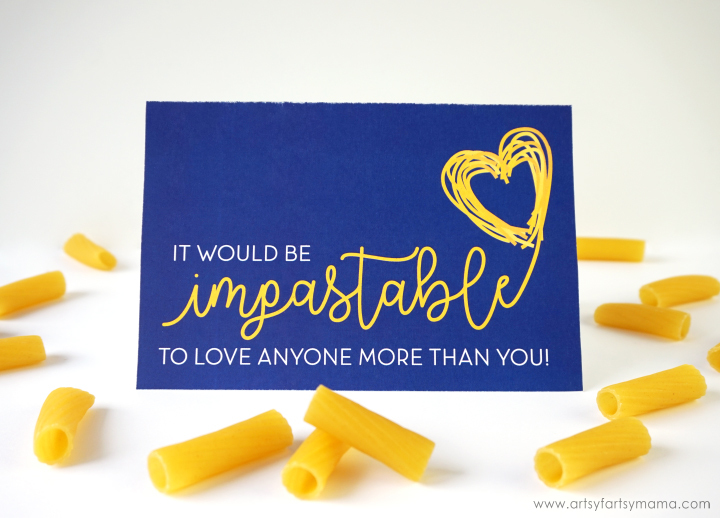 They've created some clever Pasta Memes for you to share with your friends and loved ones for Valentine's Day! Check out the Barilla Website for more information, check out the Mix & Match Flavor Website, and be sure to grab the Cartwheel Offer 5% off Barilla Pasta & Sauce at Target to save on your Barilla pasta dish ingredients! What's your favorite pasta dish to make for date nights at home? What a fun, simple recipe. We are big pasta alfredo fans over here, so I will definitely give this one a try! PS I LOVE your "punny" Valentines, too! Pinned! I dont have a springform pan but have lined a round cake pan with foil or parchment and up the sides to lift out when all baked. Works pretty well. Thanks for the tip. I don't have a springform pan, either, so definitely like the options you suggested. I made this following the recipe the first time,the second time I added crumbled bacon in the sauce then poured it over the pasta. Could I add double cream for a carbonara effect?